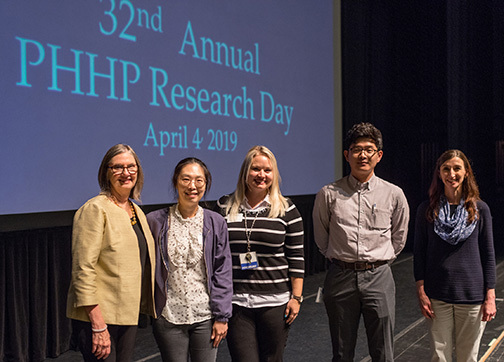 The UF College of Public Health and Health Professions hosted its 32nd annual Research Day on April 4 at the Curtis M. Phillips Center for the Performing Arts. The event featured 113 poster presentations by undergraduate students, graduate students and postdoctoral fellows and associates. Dr. Linda Cottler, associate dean for research, Jayoung Kim, Chantel Ulfig, Young-Rock Hong and Dr. Nicole Marlow, chair of the PHHP Research Committee. Mor is the director of the Research Career Training Program Core at the Center on Health Services Training and Research, and the Center for Long Term Care Innovation and Quality. He is a research health scientist at the Providence Veterans Administration Medical Center and a member of the National Academy of Medicine. He has evaluated the impact of programs and policies in aging and long-term care, including Medicare funding of hospice, changes in Medicare nursing home payment and the introduction of quality measures. He was one of the authors of the congressionally-mandated Minimum Data Set for Nursing Home Resident Assessment and the architect of an integrated Medicare claims and clinical assessment database used for policy analysis, pharmaco-epidemiology and population outcome measurement. In his presentation, Mor described studies of non-pharmaceutical interventions developed to ameliorate disturbed behavior among people with dementia, including a personalized music program for nursing home residents. He explained challenges researchers face when working with health care systems to implement their interventions on a large scale. Mor presented a framework he designed to help scientists evaluate the readiness of an intervention for dissemination into health care systems called the Readiness Assessment for Pragmatic Trials. “I believe it’s our responsibility to partner with health care systems to implement the most salient features of these kinds of interventions in a way that can be implemented and actually done for and by the health care system for their patients,” he said. 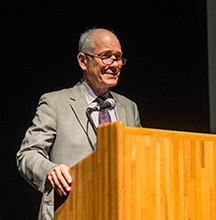 The lecture is available to view at https://bit.ly/2TM0UEX.